A friend of mine from Korea traveled Thailand for a couple of months and sent me a couple of postcards, which is so lovely of her. I’ve never been to Thailand myself, but all the photos and stories she posted on the mobile app looked like a relaxing place to visit. She even took a cooking class one day and made a pad Thai and green curry. Yum! I should definitely ask her to make one for me when we catch up next time and get some recipes to see how real locals make their curry. 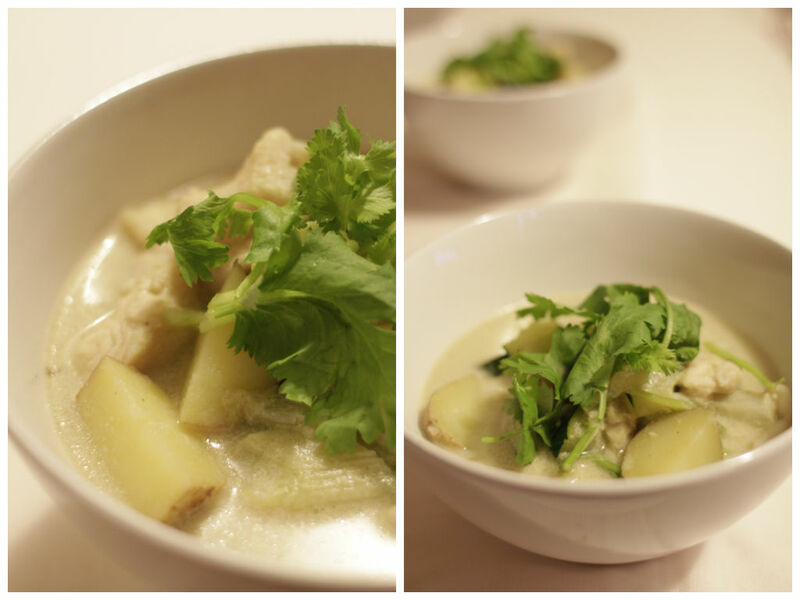 I made this green curry with chicken breast last time, but tried with fish fillets today, which was as delicious! Thai green curry paste is made of turmeric, chilli, kaffir lime, lemon grass, garlic and galangal (similar to ginger root), which all have wonderful medicinal properties. Turmeric aids digestion and detoxifies your system. Chilli is an excellent antioxidant, rich in vitamin A and C. Kaffir lime stimulates digestion and prevents cancer and high blood pressure. Lemongrass helps to fight against cold, congestion, fever, cough and sore throat. Garlic, without a doubt, a powerful detoxifying agent. Galangal is also a stimulant for digestion. So overall curry is tasty as well as nutritious, but it is high in saturated fat and calories because of the coconut oil and milk in coconut-based curry. So eat in moderation. Opt for low-fat coconut milk if you are concerned. Pat dry the fish fillets, season with salt and pepper, cook in a pan with coconut oil 2-3 minutes each side. Take it off the heat and set aside. Add another teaspoon of coconut oil in a pan and cook all chopped veggies and curry paste. When the veggies are cooked al dente, add coconut milk and water and simmer for 10 minutes. Put the fish back to the pan and combine with the curry. Serve over the rice. Garnish with fresh coriander and a squeeze of lemon/lime.